Registered in The Chinese Armorial, October 23, 2012. 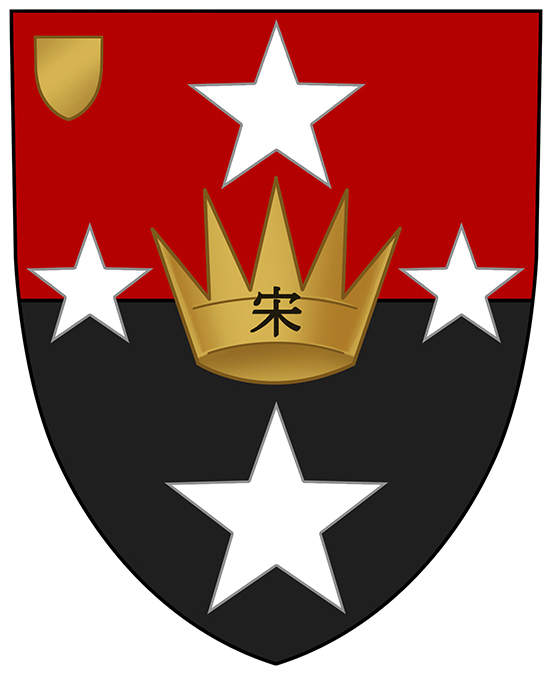 Arms: The arms of Sir John Yocklunn differenced with a shield Or in dexter chief. Grant: College of Arms, September 28, 1992, via an endorsement on the back of the Letters Patent granting arms to Sir John Yocklunn on December 3, 1984. When Sir John Yocklunn petitioned for his grant of arms, he had requested that his sister be included as one of the heirs to the arms, but the heralds overlooked her when they wrote the Letters Patent. On September 28, 1992, the College of Arms added an endorsement to the back of the Letters Patent to extend the grant to other descendants of Sir John's father, Charles Soong Yocklunn. The endorsement effectively extended the grant to Sir John's sister, Mrs. Moya Germain. As a married woman with a non-armigerous husband, her arms are differenced from those of her brother by adding a small shield as a charge in dexter chief, in accordance with the practice of the College of Arms. (Information compiled from: "East Meets West: The Arms of Sir John Yocklunn" by Stephen Szabo, Heraldry News, no. 46, November 2007).